(also called eco-printing) is a method where the leaves are positioned on fabric or paper, clamped or rolled tightly, and then processed in simmering water. The impressions left on the materials are from the pigments released by the leaf. This unique printing technique was explored and developed by my teacher and mentor, Australian artist India Flint. is a process where leaves, flowers, and other plant materials are used as the color source in the dye bath. A variety of natural mordants can be used to treat the fabric to ensure color fastness. is a technique in which fresh leaves and other plant materials are used as printing plates. 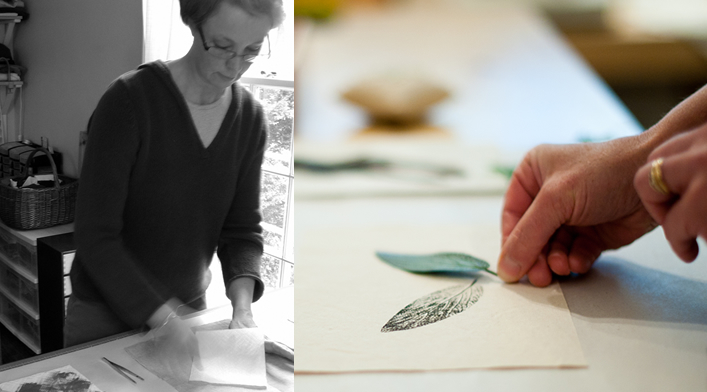 The leaf is coated with paint and then pressed onto the fabric. The resulting impression is an intricate copy of the original leaf.